Without a doubt, Asbestos is one of the deadliest chemical compounds to have ever been used in building materials, horribly affecting those who have come into contact with it. No matter if you’re building or renovating, material laced with asbestos needs to be treated with caution. You have probably heard many times about the dangers of asbestos and why you need to take caution when removing it. No amount of asbestos exposure is considered safe so it needs to be removed carefully, this means wearing the proper clothing and breathing apparatus. When inhaled, even the smallest dose will aggravate lung tissues and cause scarring. Over time, the build-up of scar tissue can lead to health issues, including asbestosis, pleural plagues, heart problems, and cancer. Don’t risk it; be sure you are safeguarded against asbestos and dispose of it properly. Your long-term health and safety should never be compromised when it comes to removing asbestos-laden material. Although you don’t need a specific permit from your local council to remove asbestos, you may need approval – this is particularly important if you are planning any demolition work on a job site. If you aren’t sure about the process, you need to speak to your local council immediately. They will advise you on the proper processes and procedures involved when undertaking such a task. With our asbestos bins, the same rules apply as with general waste bins, meaning you can’t mix other waste in with asbestos material. We encourage our clients to dispose of the asbestos material as quickly and as safely as possible. If you have other waste along with the asbestos, you will need a second skip. We value safety over convenience so it’s important for you and our drivers to be protected from the deadly chemical. When it comes to disposing of asbestos materials, it is better to be safe than sorry, which is why we encourage clients not to dispose of the materials with other rubbish. 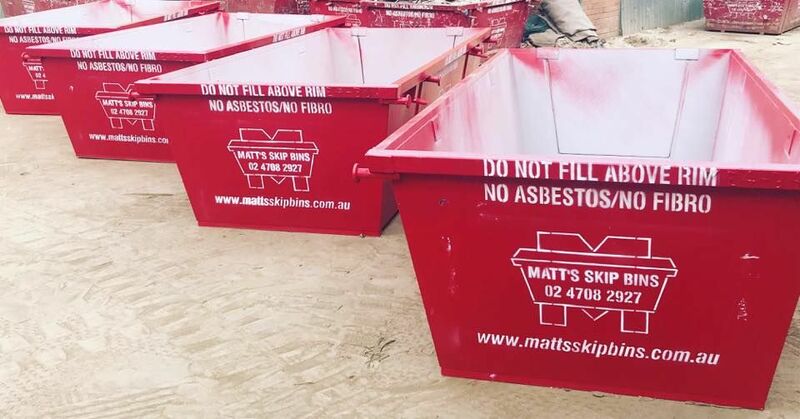 If you are in need of a skip and have rubbish that contains asbestos, speak to Matt’s Skip Bins today. Contact us online or call us on (02) 4708 2927 and we’ll discuss your bin needs.